Mr. Abraham Vergis, former Director at Drew & Napier LLC (one of Singapore’s oldest and largest law firms) has set up Providence Law Asia LLC, a boutique law practice specializing in international arbitration and litigation in Singapore. The practice currently serves multinational companies as well as private wealth clients. It is adept at international arbitrations as well as courtroom litigations and has handled a variety of contentious work in diverse industries such as finance, oil and gas, aviation, logistics, construction & engineering, IT and entertainment. Providence Law Asia aims to establish itself as the counsel of choice for complex international litigations and arbitrations across Asia. To that end, it specializes in three core areas namely, 1) international arbitrations, 2) corporate-commercial disputes and private wealth litigation as well as 3) fraud, compliance and criminal prosecutions. “In addition, modern Singapore law is a forward-facing and business-sensible legal system that is in step with international commercial realities, and is a worthy alternative to English law or New York law as the governing law for contracts concluded in Asia,” he added. 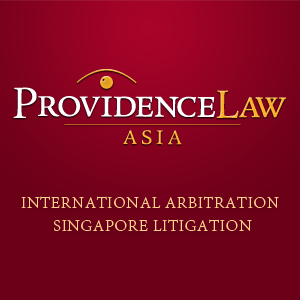 Providence Law Asia LLC is a boutique law practice specializing in international arbitration and litigation in Singapore. Its areas of expertise include 1) international arbitrations, 2) corporate-commercial disputes as well as and private wealth litigation as well as 3) fraud, compliance and criminal prosecutions. Providence Law Asia has also handled a variety of contentious work in the finance, oil and gas, aviation, logistics, construction & engineering, IT and entertainment industries.